Publisher/Year Published:2008 by Sourcebooks, Inc.
How I got this book: eBook for my Nook, then in book form from the library. I normally do not like to own books unless I know I am going to read them over and over, but in this case if this book is what I think it is (a font of awesome knowledge of English) I would want it on my shelf. One of my more recent pastimes has been filling myself with Jeopardy like information. This book would not only add to that store, but give me more fun facts about a language that I've spoken my whole life. Because seriously, who the hell doesn't want to know where some of those bizarre phrases came from? I mean I just learned from reading the back that "best man" is an allusion to the best man to help capture you a wife. How interesting. iceburg lettuce got its name from the fact that California growers started shipping it covered with heaps of crushed ice in the 1920s; it had previously been called crisphead lettuce. iced tea is the correct form and will probably not change the way iced cream and iced water did. This give you a taste of what you can find approximately 20 per page on 300 pages. It's really interesting trivia, but not something you can sit down and read. Saying as much, I've not actually finished it, but am enjoying reading it in small bites. I especially like having this on my Nook so I can read this when I don't have too much time to commit to reading; in line at the store, for example. If I get pulled away from what I am reading, it doesn't matter because it's a short sentence of knowledge and I can pick up right where I left off without feeling as if I've left the world I was involved. In conclusion, a great trivia book filled to the brim with random knowledge. I really think this would make a great coffee table book! This sounds like such a fun book. I love trivia and I love learning about language. This sounds intriguing but definitely not something you'd sit down and read in one sitting. Good thing to pick up here and there. I love trivia and am always intrigued by the origins of words and phrases. Great short clips on words, but it sounds like you were expecting more anecdotal info. There is a book I have that sounds more like what you sought. And, as soon as I find it in this crazy place I will let you know. 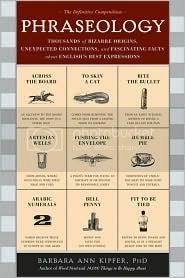 There is also What Jane Austen Ate and Charles Dickens Knew: From Fox Hunting to Whist-The Facts of Daily Life in Nineteenth-Century England a darn handy reference for fiction readers! This does sound super interesting! I loved learning about the iceberg lettuce, but definitely see what you mean about not reading it all at once. I love these kinds of books. Sometimes I buy them for the library, and just leave them laying on the counter so kids will pick it up and start sharing "factoids." Lots of fun. Thanks for bringing this to my attention. Yeah when I do pick this up it is really enjoyable. I read The Mother Tongue: English and How it got that way and thought it would be more like that! @Steph This sounds like something I'd really like! The evolution of language fascinates me! I also like etyology, but I also like trivia-type information. I could get into a book like this a few entries at a time. I have also read The Mother Tongue and found it very interesting. I am glad Santa was good to you. Sounds a lot like an Ammon Shea book about reading the dictionary. I suspect I'm crazy enough to actually sit down and read this as a book-book, instead of trivia snippets, but then, I used to be an academic involved in the study of language, and this seems like it's right up my alley.